But don't let that number fool you. There has in fact been a dire lack of emojis to reflect our diverse world. Fortunately, that is beginning to change. While Emoji 12.0 comes with some fairly trivial newbies (a melting ice cube and a yo-yo, for instance), it also offers users an array of other options we haven't seen before, such as a prosthetic arm and leg, a person in a wheelchair (both manual and automatic), a person with a probing cane, a deaf person, an ear with a hearing aid, a service dog, interracial couples and gender neutral couples. "Representation is a common topic within the disability community," says Kendall Brown, a disability advocate and digital strategist. "Disabled people are rarely depicted in popular media, and when we are, it's nearly always simply as a secondary figure meant to help the main character learn something and it's almost always played by an able-bodied actor." Brown lives with invisible disabilities including Crohn's disease and a spine disorder. These types of disabilities are not featured in the new fleet of emojis, but the new options are still a welcome update for her. 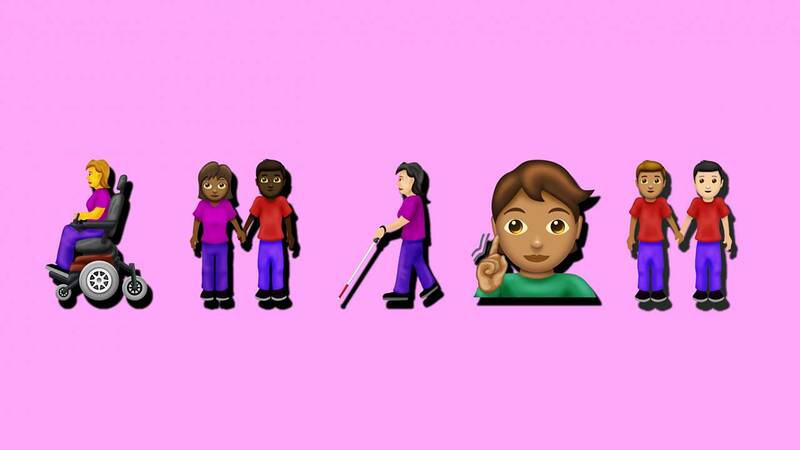 "While the new disabled emojis don't directly visually represent my personal health conditions or how others perceive my body, it still feels like they represent my experience and my community, in a way," she says. "At the very least, they certainly represent an acknowledgement that disabled people exist, and that feels good." "If our vocabulary is impoverished, we're constrained in important ways," Haque tells NBC News BETTER. "The richness of our language should match the richness of human experience, and that includes electronic language which is only getting more popular." Haque adds that these emojis may seem like "simple or even silly" fixes to the bigger societal problem of marginalization, but they're incredibly useful and needed tools. "These emojis are contributing to a social model of disability teaching," says Haque. "If you enhance opportunities for people to represent their experience in the world, the possible negative impacts of that disability are diminished, similar to how a functional crosswalk can lessen the challenge of crossing the street if you're visually impaired. [More over], being able to represent the non-typical bodily state can be not only empowering, but a way in which people can communicate their experiences." Rosalind Chow, associate professor of organizational behavior and theory at Carnegie Mellon University's Tepper School of Business, says the "option is great for this sense of feeling equally valued and included by society." Chow notes that her daughter enjoys sending emojis that portray her parents, but hasn't yet been given the choice of an accurate representation. "She could never find emojis that represented our racial composition," Chow says. "I'm Asian and my husband is white. We always ended up as the white couple — at least we had the brunette option." "Business schools have struggled for a long time with gender equality, and one thing that was identified as causing women to feel as though they didn't belong was that all business school cases featured male protagonists," Chow says. "Harvard recently started generating cases of female protagonists so everyone could see and imagine women being in leadership positions. It's about reflecting reality as well as what society has as an aspiration." Celeste Viciere, a licensed mental health clinician and host of "Celeste The Therapist Podcast", sees these new emoji options as more ways for people to connect with, and possibly better understand one another. "It's a great thing that we are seeing an expansion in emojis for people who have been marginalized," says Viciere. "Psychologically, we feel like we matter and have a stronger connection to society when we see people who look like us in our everyday life and through all mediums. When emojis were added that displayed African-Americans and other people of color in different shades, it gave people a feeling of validation and the ability to participate in something where they are represented. It's important as a society that we are intentional in making sure everyone is represented because diversity is what makes the world a beautiful place."